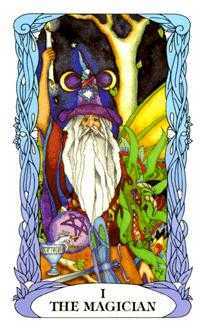 The complete 78-card Tarot pack is divided into two sections: 22 Major Arcana and 56 Minor Arcana cards. 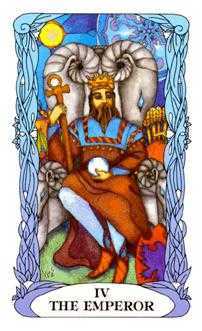 The Major Arcana are 22 trump cards, usually numbered 0 through 21 and displaying names such as “The Empress or “The Fool.” The Minor Arcana contain four suits of fourteen cards each, ace through ten and four court cards: king, queen, knight, and page. 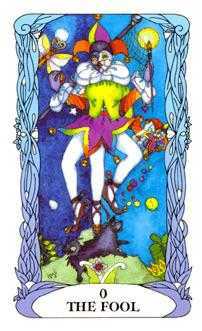 The suits of the Tarot of a Moon Garden are Swords, Staves, Cups, and Pentacles. From time immemorial, humanity has gazed at the changing phases of the moon and imagined magical seas and gardens on its surface. 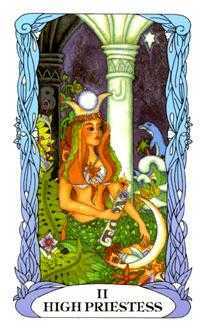 In mythology, the moon is symbolic of psychic and magical powers. Scientists named the dark area of the moon’s geography “mares” or sears because of their likeness to earthly bodies of water. In literature, creative minds such as Milton, Poe, Wells and Verne have speculated about the enchanted terrain one might encounter on the moon. They describe whimsical creatures, such as unicorns and dragons, inhabiting lush jungles of vegetation that grow to incredible heights in a single lunar day. Deep valleys undulate across the entire surface of the moon and castles sit atop lofty mountains. Beneath this lunar Garden of Eden lies an underground world of deep, mysterious caverns where insects of iridescent colors possessing magical powers flutter among exotic lunar flowers. The seas contain creatures ranging from serpents to dolphins. Flying chariots of all descriptions and hot air balloons are said to be used to gain access to the lunar realm. 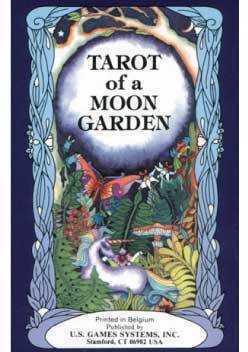 From these magical images, the whimsical symbols used in the Tarot of a Moon Garden have emerged. The dragonfly forms the hilt of the suit of Swords. Unicorns act as guides through the wonderland of the lunar landscape. Dragons indicate areas for transformation and warn of temptation. 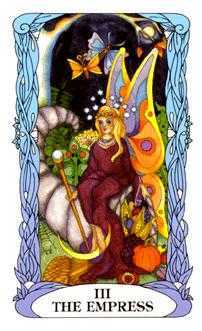 Butterflies hover near wild mushrooms and lush ferns in the dense lunar forests. Hot air balloons are sometimes sighted in the gardens of the moon bringing visitors from other worlds. Castles serve as welcome hospitality to those seeking shelter. Beneficent angels and playful fairies offer guidance and camaraderie as the seeker journeys through the experiences of the Major and Minor Arcana cards of the Tarot. Dolphins inhabit the sapphire depths of the lunar seas acting as helpful messengers for those who quest with a pure heart. 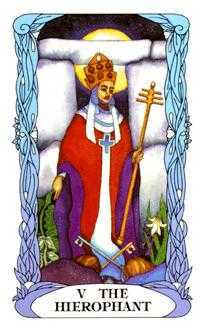 The Moon herself appears in many cards, representing the triple goddess maiden, mother, and crone in her waxing, full, and waning faces using the borrowed light of the sun to shed her moonlight upon her creations.